Barns of Rose Hill. 95 Chalmers Ct. Berryville. The finest musicians in the area perform. 8–10pm. $20 in advance, $25 at door, 12 and younger free. Barns of Rose Hill. 95 Chalmers Ct. Berryville. A trained moderator will oversee a discussion open to all residents and designed to help people from different backgrounds and viewpoints connect and better understand each other. 4–6pm. Free. Long Branch Historic House and Farm. 830 Long Branch Lane. Boyce. Clarke County native and local history expert Jesse Russell will discuss his new book, “Juliet: From Slavery to Inspiration.” Refreshments prior to talk. $10 ahead, $15 at door. 6pm. WorkshopBerryville Physical Therapy and Wellness. 322-A N. Buckmarsh St. Learn about this troublesome condition and various forms of treatment. Free interactive session with questions and answers at end. 540-955-1837. 6:30pm. Sanctuary Wellness Center. 208 N. Buckmarsh St. Berryville. Led by Amy Hope-Gentry. $10 per person. 7pm. awww.amyhopegentry.com. www.sanctuaryberryville.com. Chet Hobert Park. 225 Al Smith Circle. Berryville. More than 75 crafters and artisans will offer unique, handcrafted products. Show moves into recreation center in case of rain. Free admission. 9am–5pm. 540-955-5147. Barns of Rose Hill. 95 Chalmers Ct. Berryville. Early jazz and country with a unique, DIY style. Dance party after concert. Dinner at 6pm with Jordan Springs barbecue for sale, concert at 7pm. $20 in advance, $25 at door, $30 at door for seated and dance party tickets. www.barnsofrosehill.org. Duncan Memorial United Methodist Church. 210 E. Main St. Berryville. 13 local churches get together to provide a meal open to all in the community the fourth Thursday of each month. Free. 5:15–6:30pm. 540-955-1264. Chet Hobert Park. 225 Al Smith Circle. Berryville. Led by Adrian VanKeuren. Participate in demonstrations, experience grounding and chi flow and learn how Tai Chi can bring stability to your life. 9–11am. www.worldtaichiday.org. Historic Long Branch House and Farm. 830 Long Branch Lane. Boyce. Led by Colette Poisson, who worked with the previous owner. Adults $8, children younger than 12 free. 12–4pm. 540-837-1856. Historic Long Branch. 830 Long Branch Lane. Boyce. Reception and artist talk with Isabelle Truchon, who will exhibit paintings from the ROAM collection. Refreshments served. Free. 6–8pm. 540-837-1856. Barns of Rose Hill. 95 Chalmers Ct. Berryville. Lloyd Martin and Vox perform folk music with ukulele, mouth trumpet, hand percussion, bass, finger-picked guitar and harmony. 8–10pm, Jordan Springs Barbecue available ahead for purchase. $15 in advance, $20 at door, 12 and younger free. www.barnsofrosehill.org. 540-955-2004. Watoga State Park. 4800 Watoga Park Rd. Marlinton, W.V. Geo Giordano is keynote speaker at festival with foraging hike, vendors, demonstrations, live music and more. 3pm. www.wvstateparks.com/event/wild-ediblesfestival. Season Opening Day Town parking lot next to Dollar General. 20 S. Church St. Berryville. Food trucks, Bar C Ranch petting zoo, live music and many vendors selling meat, produce, cheese, vegetables and much more. 8am–12pm. clarkecountyfarmersmarket.com. Christ Church. 809 Bishop Meade Rd. Millwood. The Blue Ridge Singers will perform under the direction of Dr. Jeff Albin. Light refreshments served afterward with meet and greet with performers. Free, suggested donation $10. 4pm. Concert Barns of Rose Hill. 95 Chalmers Ct. Berryville. Soprano Angela Marchese is a passionate and versatile artist whose “rich, burnished voice” has thrilled audiences both locally and abroad. 8–10pm. $20 in advance, $25 at door, 12 and younger free. www.barnsofrosehill.org. 540-955-2004. Barns of Rose Hill. 95 Chalmers Ct. Berryville. Karan Casey has long been one of the most innovative, provocative and imitated voices in Irish traditional and folk music. 8–10pm. $25 in advance, $30 at door, 12 and younger free. Burwell Morgan Mill. 15 Tannery Lane. Millwood. Runs through Sunday, May 12. 250 artists display for sale over 1000 works of art in a historic 18th century, operating mill. Saturdays 10am–6pm, Sunday–Friday 12–5pm. Adults $5, seniors $3, children 12 and younger free. 540-837-1799.Farmers MarketSaturdays, May–October, 8am–12pm. Town parking lot next to Dollar General. 20 S. Church St. Berryville. Many vendors selling meat, produce, cheese, vegetables and much more. Long Branch Historic House and Farm. 830 Long Branch Lane. Boyce. 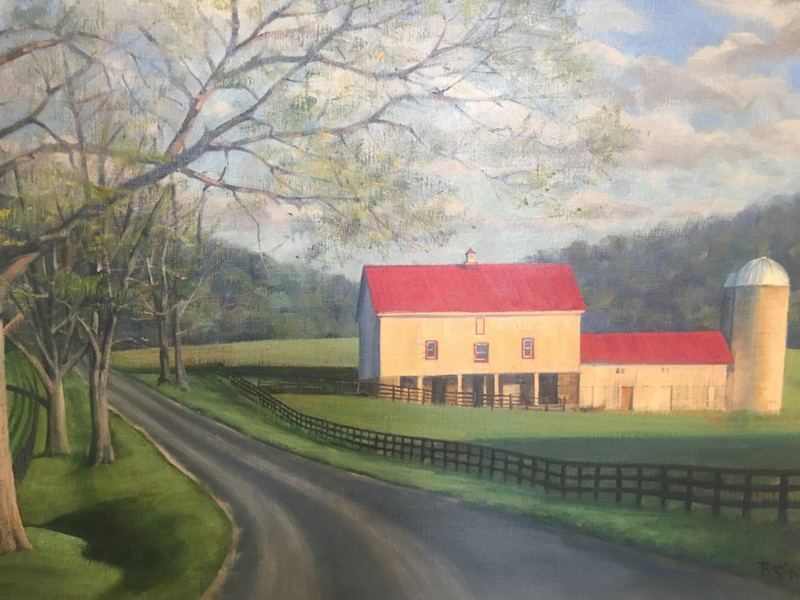 An exciting opportunity to purchase work by renowned Virginia contemporary realist painter and portrait artist Bradley Stevens. Through April 22. 540-837-1856. Thursdays, 5:45pm. Historic Long Branch. 830 Long Branch Lane. Boyce. Vinyasa Flow class has you move at a sweet and mindful pace. $20 to drop in or ask about class passes. 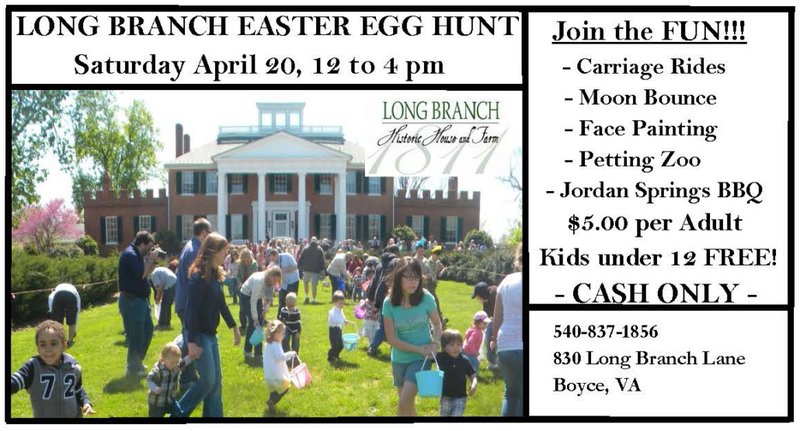 540-837-1856. www.visitlongbranch.org. Alcoholics AnonymousTuesdays, 8:15–9:15pm. Grace Episcopal Church. N. Church St. Berryville. 36 E. Main Street. Berryville. Open Wednesdays 9am–12pm and Sunday 2–5. 540-955-1823.